Things change so fast in Social Media and technology, don’t they? You might have heard about Meerkat that made a big splash at SXSW. in 2015. Often, it is difficult to distill the value out of new services, platforms and products. I believe that Meerkat and the like platforms that follow have a real opportunity in B2B. Meerkat is a one-way live video streaming app officially launched in February 2015. It is very simple to use. Download the Meerkat app from the App store, and login through Twitter. Users stream live video from their phones (in portrait mode) directly to Twitter. While the stream can go in and out the quality is amazing overall. Viewers can “chat” and ask questions directly in the app, but those chats post directly to Twitter. The stream is not recorded, although new services like Katch allow you to capture, save and rebroadcast the stream. For celebrities like Jimmy Fallon, it is amazing and extremely personal to watch brief behind the scenes interactions from his show. Because it is not produced, the video feels like FaceTime. Gary Vaynerchuck uses Meerkat to stream his show, and still draws people to his YouTube channel by not doing his whole show live. Just like anything else, eyeballs, audience, and engagement matter. For now, the community is small enough that a few have gained notoriety by streaming non-stop with nonsense. A leaderboard and gamification encourages some of the nonsense, but you quick figure out those that are worth following just like on Twitter. 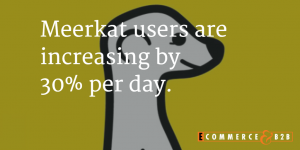 B2B Marketers have the opportunity to use Meerkat to build better relationships with prospects and customers. The non-scripted and personal nature of the platform is different and enables transparency that is fascinating in my opinion. And an opportunity. People are drawn to video because our brains focus on faces when gathering information. Body language can show passion and genuineness. Simple body movements captivate attention and keep watchers focused on the message. Demo Your Products Live. Show your products in a real setting. How they are used, what is in the box, and even crazy applications of the product. Behind the Scenes Interviews. Take live video interviewing your people, thought leaders and your customers. Get off the cuff reactions. People buy from people. Let your customers and prospects get to know your staff. Live Stream Events. From breakfasts to big events, use Meerkat to both show the Live events and get reactions from the audience and attendees. Ask Me Anything (AMA) Sessions. It is hard to get thought leaders in your organization to blog and product content, but it may be easier to schedule 30 minutes to just take questions from your audience. Market Reactions. As things happen in your market, you may not want to have your perspective on paper. Schedule a session to react to industry news, analyst predictions, PR, etc. Like anything else, Meerkat may not be the platform that survives, but Live video will certainly survive. I enjoy figuring out how new platforms and ideas can be applied.